I found this and was going to buy it. We have an agreed price ($28K) and I was going to buy. However today when my wife came home from work she told me her job is going to be eliminated. With that said I will not be spending the money for a toy. I will email the owner and inform him tomorrow. 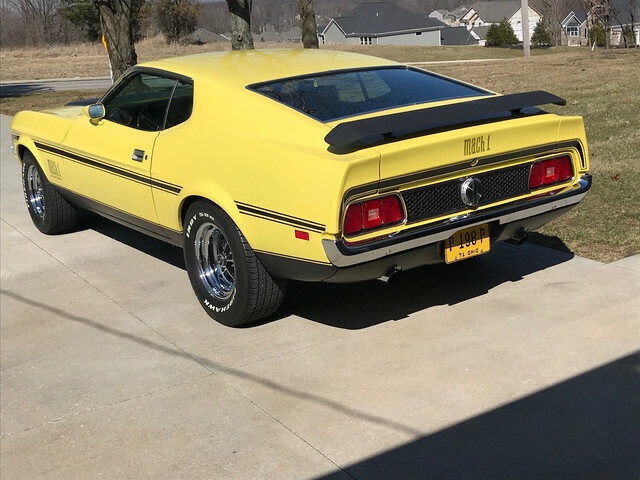 All of the pics he sent me show a very nice well restored Mach 1. If anyone is looking to buy, this car is worth looking into. I don't know the owner personally, All I know is he owns a Tool & Stamping business and seems to be ready to sell. Sure looks like a nice one. Sorry you were unable to go ahead with the purchase. That is much better than 99% of them are. The chrome bumper and the hood stripe looks a little off on the width of the outer band. Should have hood locks if hood was black. Has an AM/FM but no door speakers. Could have been ordered with chrome bumper matri would tell or build sheet. You could not build that car for that money for sure. Not to be too critical but i wonder why the license plate is different from picture 12 to 13. Only a guess as to the difference in the licence plates. 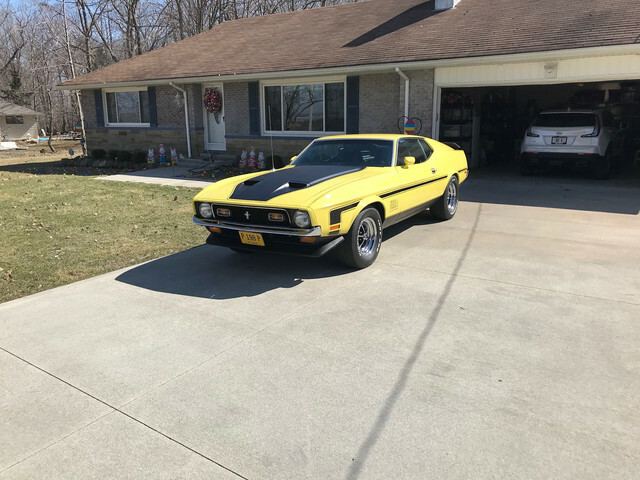 This guy has 5 classic Muscle Cars, he may swap out the tags........again, only guessing. When he sent me several other pictures I requested, his garage was full of very nice cars. Does your wife have a job that is in fairly high demand- nursing, etc.? If there is a good chance she will be hired elsewhere fairly quickly, you may want to roll the dice on this one. You might have to look long and hard to find another one in that shape and at that price. And you may never find one at that price point, without buying a car that needs a lot of work done. This is all assuming you have done your research and the car looks that good in person, inside and out. Take my advice with a grain of salt as I do not know your financial position. Maybe you can come to some agreement with the owner to hold it for a little while after a down payment. It's winter now in PA and there's not a lot of car buying action going on. This is so funny! What a small world it is when it comes to these cars. I restored and sold that him that car!! I can give the details to anyone interested in it. I sold him the car for $28K in 2015. It is easily worth that and more now. As was already mentioned, you can't restore a car for that price these days! 2F03R, Grabber Blue, Wht Dlx, Wht Tp, Dcr Grp, Tach, etc. 2F03R, Bright Blue, Wht Dlx, Wht Tp, Dcr Grp, Tach, etc. And 8 more verts, 2 Boss 351s and 1 M-code Mach I's! Cool, nice looking car! Congrats on your new ride and Welcome to the site from Michigan. Congratulations on a good buy. Please go to the Introduction section of the forum and introduce yourself and your call. Be forewarned, most members will want to see more pictures.